When the rains comes down like it has recently, it's time to gather up the kids, put on the rain boots, and hike to a waterfall in Marin. One of our favorite local waterfall hikes is the Ken Harth Waterfall Trail at Indian Valley Open Space Preserve in Novato, a short and easy hike that almost anyone can manage. We've even seen sturdy offroad strollers on the trail (although we wouldn't recommend it). To get there, take the Indian Valley Fire Road from either of College of Marin's Indian Valley Campus or the Indian Valley Road trailhead to where it meets the Ken Harth Waterfall Trail. On they way you'll be accompanied by a rushing stream that runs along the trail. There are usually plenty of horses and dog walkers sharing the fire road with you. Cross over a little wooden bridge into the woods and follow the trail—you'll hear the waterfall before you can see it. Bear right on the trail and you'll end up at the foot of the waterfall, which plunges about 10 feet down a rock cliff face into a pool below. If you bear left you'll end up at the top of the waterfall watching it spill down into the pool and creek below. The walk there on the fire road is about a half-mile from the IVC parking lot and slightly longer from the Indian Valley Road trailhead. Once you turn off onto the Waterfall Trail, it's about a quarter mile to the waterfall. It's not the biggest waterfall in Marin, but it's a beautiful hike and the waterfall can really get going after a big storm like the ones we've had over the last few weeks. You can make this part of a larger hike on the many trails that criss-cross the preserve. There's even an organic farmstand you can visit on Saturday mornings! Read more about Indian Valley Open Space Preserve. The easiest way to get there is to park in the back lot near the sports fields at the College of Marin Indian Valley Campus, located at 1800 Ignacio Boulevard in Novato. To get there, take Highway 101 to the Ignacio Boulevard exit, then head west on Ignacio Boulevard until you enter the Indian Valley Campus. Head all the way to the far end of the campus and park in one of the lots there. There's a parking fee here of $4, except on Sundays and holidays. The other way is to start at the trailhead on Indian Valley Road. Prepare to get wet and muddy on this hike, especially after a big rainstorm! Rain boots or waterproof hiking boots are a must. While the trail to the waterfall is easy to manage, some of the sections of trail around it can be steep and slippery, so use caution. On-leash dogs are welcome on the trail. 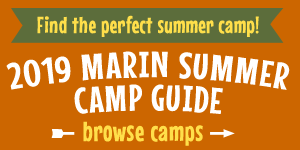 For more infomation and a downloadable trail map, visit www.marincountyparks.org.